At the beginning of the complete piano course level 2 I introduced you to the major chords ( Click here for a reminer. I told you that major chords are often being interprated as optimistic or happy. Today I'd like to show you their melancholic brothers. The minor chords. I will first introduce you to the concept of minor chords and then focus on the A minor chord so that in the next piano less you'll be perfectly able to play the song ONE LOVE by Bob Marley. The story of the minor chords is a simple one. Let's start with the theoretical level. 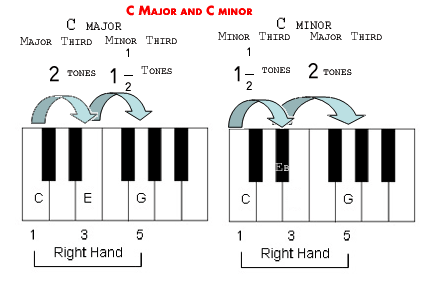 The minor piano chords however, are built of a minor 3rd and a major 3rd. So you basically switch the order of the intervals of the major chord. Let's take C major for example. It contains the notes C E G. In order to turn it to C Minor all we have to do is lower the major third in half a tone and press on E flat instead. At the end we stick with these notes (C Eb G). The minor third in the minor chords sounds more mellow and melancholic in comparison with the major third of the major chord and that's why the minor chords are being often interpreted in music as the sad mellow ones. Listen to sound of the chord and try to identify its mood in your ear. Tip: If you're having difficulties with finding a certain minor triad seek for the major chord first and then lower the major third into a minor third. Remember: Developing your musical ear is the key to success on the long run. That's what we are aiming for. When we'd like to state a minor chord, C minor for example we'll write the root note in a big letter just as we did with the major chord and we'll add a small m letter next to it. C minor would be written as Cm for example. Now that we know how to build a minor chord on the theorotical level and we have an impression of how a minor chord should sound let's try to builts an A minor chord. What we have to do is take the A key as the bass note of the chord and count one and a half tone (a minor third) in order to reach the next note. We end up with C. Now let's count 2 tone from C to look for the major third. 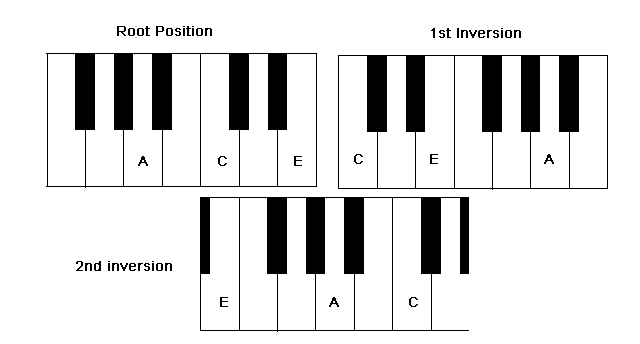 So A minor chord is made out of the notes A-C-E.
Now, the only thing we need to do before we continue to the next piano lesson is be familiar with the Chord inversions of the chord. Look for the chord inversion of the chord by replacing the lowest note of the chord above the upper two. Repeat the process until you reach the root position again (Have a look at the image). 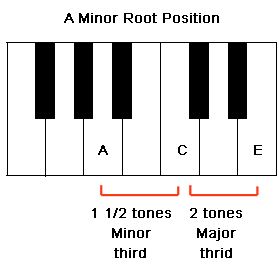 If you only follow the piano chords lesson try to find all Minor Piano Chords by ear. (Find the major chords first and then lower the major third in half a tone). Click here to see if you get it all right. 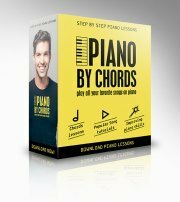 THE FAST AND EASY WAY TO LEARN PIANO! "Your entire site is simply fantastic. I really loved it. Now I am learning the basics of piano by myself, with your really great help. Thank you very much!" "I only started to play about six weeks ago but the last hour of watching your videos about chord progressions has been something of a revelation. You're brilliant!!!!" "I'm a beginning keyboard player and your video's are an excellent guide. You're absolute not in a hurry, and take time to explain. I'm sure I'll follow all your lessons to get the hang of playing the piano/keyboard!" "Thanks for all your work ( tuto and others ). You're doing a really great job, You're the best internet teacher I know."